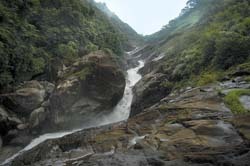 on april 18, 2007, the Kerala government gave 'administrative sanction' to the Rs 247-crore Pathrakkadavu hydroelectric project (phep) near the Silent Valley National Park in Palakkadu district and sent the plan to the centre for approval. The project envisages a 64.5-metre-high dam with storage capacity of 0.872 million cubic metres on the Kunthi river to generate 70 mw power. The river flows through the park. Environmentalists say phep is as threatening as the once-abandoned Silent Valley Hydro-Electric Project (svhep), which was called off due to widespread protests in 1980. "The (present) project area falls within the park's buffer zone. It will submerge 4.10 hectares (ha) of forest," says environmentalist M K Prasad. "The government should have expanded the park boundary," he adds. But the state government does not give much credence to these concerns. "Kerala faces a power crisis. We will have to add 1,500 mw in the next 10 years. We are not against environment," says A K Balan, state electricity minister. The Kerala State Electricity Board (kseb), which proposed the project in 2001, says the dam will be 500 metres away from the official boundary of the park. A rapid environmental impact assessment (eia) conducted in 2003 by Environmental Resources Research Centre, Thiruvananthapuram, says that 22.16 ha of forest will be submerged. kseb says this is negligible given svhep would have submerged 830 ha of forest. But many cry foul. "A detailed eia has not been conducted," says A Latha of the Chalakkudi River Protection Forum. kseb conducted a public hearing in May 2004 after the eia and the result was stiff resistance from the public. The National River Valley Authority, after assessing the situation in October 2006, asked the government to conduct another hearing, which is yet to take place. "In 1982, a committee headed by M G K Menon, secretary to the central government's Department of Science and Technology, had warned that a hydroelectric project near the valley will damage the ecosystem," says Prasad. The government's argument on power doesn't hold much water. "To generate 70 mw, water flow at the dam site should be at least 22,000 litres a second. This has not been measured," says R V G Menon, former director of the Integrated Rural Technology Centre, Palakkad. "The project report was based on old data. Rainfall pattern and river flow do not match and are exaggerated," he says. Instead of moving ahead with phep, the state government should find alternatives like checking power theft for which Kerala has the most dubious record in the country, he says.